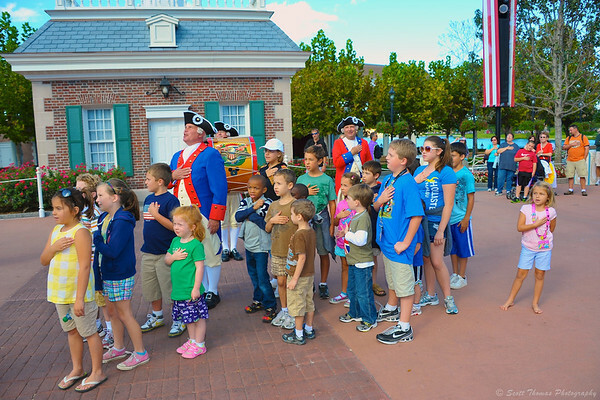 Members of the Spirit of America Fife and Drum Corps lead young guests in the Pledge of Allegiance in front of the American Adventure at Epcot’s World Showcase. Nikon D700/28-300VR, 1/160s, f/6.3, ISO 200, EV +0.3, 28mm focal length. I have featured the Spirit of America Fife & Drum Corps a few times over the years on this blog. When it comes to American Patriotism, the Walt Disney Company is a master at bringing on such feelings for the citizens of the United States. This entry was posted in People and tagged 28-300mm, american adventure, children, epcot, florida, guests, kids, nikon D700, orlando, pledge of allegiance, vr, walt disney world, world showcase. Bookmark the permalink. Very sweet! I wish you a nice 4th of July, Scott. Thanks…it was okay. Being in the middle of the week this year. It was a bit strange. Nice picture for the 4th! I had a little chuckle at a few of the kids who apparently don’t know their right hands from their left!